The book A History of Life-Extensionism in the Twentieth Century1 focuses on the history of the pursuit of life extension, even radical life extension, in the 20th century, with a primary focus on the first half of the century. Yet it also briefly explores the historical backgrounds of this pursuit in earlier periods as well as recent developments up to the present time. The term life-extensionism is meant to describe an ideological system professing that radical life extension (far beyond the present life expectancy) is desirable on ethical grounds and is possible to achieve through conscious scientific efforts. This work examines major lines of life-extensionist thought, in chronological order, over the course of the 20th century, while focusing on central seminal works representative of each trend and period, by such authors as Elie Metchnikoff, Bernard Shaw, Alexis Carrel, Alexander Bogomolets and others. Their works are considered in their social and intellectual context, as parts of a larger contemporary social and ideological discourse, associated with major political upheavals and social and economic patterns. The following national contexts are considered: France (Chapter One), Germany, Austria, Romania and Switzerland (Chapter Two), Russia (Chapter Three), the US and UK (Chapter Four). This work pursues three major aims. The first is to attempt to identify and trace throughout the century several generic biomedical methods whose development or applications were associated with radical hopes for life-extension. Beyond mere hopefulness, this work argues, the desire to radically prolong human life often constituted a formidable, though hardly ever acknowledged, motivation for biomedical research and discovery. This work shows that novel fields of biomedical science often had their origin in far-reaching pursuits of radical life extension. The dynamic dichotomy between reductionist and holistic methods is emphasized. The third, more general, aim is to collect a broad register of life-extensionist works, and, based on that register, to establish common traits and goals definitive of life-extensionism, such as valuation of life and constancy, despite all the diversity of methods and ideologies professed. This work aims to contribute to the understanding of extreme expectations associated with biomedical progress that have been scarcely investigated by biomedical history. Life-extensionism can be defined by a strong belief in the possibility and desirability of radical prolongation of human life. Champions of the life-extensionist intellectual movement extrapolated on contemporary scientific and technological achievements and perceived human progress to be unlimited, capable of radically extending the human life-span. For example, seminal biological developments of the late 19th-early 20th century – such as Jacques and Leo Loeb’s and Alexis Carrel’s concepts of potential cell immortality, Elie Metchnikoff’s theory of phagocytosis or Charles-Édouard Brown-Séquard and Eugen Steinach’s hormone replacement therapies – inspired far reaching popular expectations of radical longevity, even of a salvation by biomedical science. In fact, the desire to radically prolong human life often constituted a formidable, though hardly ever acknowledged, motivation for biomedical research and discovery. Novel fields of biomedical science often had their origin in far-reaching pursuits of radical life extension.2 Thus, the development of endocrinology owed much to Eugen Steinach’s “endocrine rejuvenation” operations (c. 1910s-1920s). Probiotic diets originated in Elie Metchnikoff’s conception of radically prolonged “orthobiosis” (c. 1900). The world’s first institute for blood transfusion was established by Alexander Bogdanov to find rejuvenating means (1926). Systemic immunotherapy derived from Alexander Bogomolets’ “life-extending anti-reticular cytotoxic serum” (1930s). And cell therapy (and particularly human embryonic cell therapy) was conducted by Paul Niehans for the purposes of rejuvenation as early as the 1930s. Thus the pursuit of life extension has constituted an inseparable and crucial element in the history of biomedicine. And yet despite this broad significance for the history of biomedicine, the subject has until now been marginalized and there have been relatively few attempts to research the history of life-extensionism and its underlying ideological and social motives.3 The present research aims to redress this historiographic gap and to examine the major lines of life-extensionist scientific and philosophical thought, in chronological order, over the course of the 20th century. Seminal works in the field are considered in their social and intellectual context, as parts of a larger contemporary social discourse, associated with political upheavals and social and economic events, with state ideologies and cultural fashions. This work pursues three major aims. The first is to attempt to identify and trace throughout the century several generic biomedical methods whose development or application, were associated with hopes for life extension. In other words, this work inquires what kinds of biomedical interventions (actual or potential) raised the expectations of radical life extension enthusiasts over the years. There exists an extensive number of sources containing suggestions for possible methods of life prolongation, written by leading scientists and science popularizers, which when studied carefully reveal a taxonomy: idealistic/holistic/hygienic approaches emphasized the importance of psychological environment and hygienic regulation of behavior, whereas, on the other hand, materialistic/reductionist/therapeutic methodologies sought ways to eliminate damaging agents, to introduce biological replacements, to maintain homeostasis, and to bring about man-machine synergy. The apparent relative weight of each method in public discourse (in terms of notoriety and prestige, funding, amount and dissemination of relevant publications) has changed with time, reflecting the initial hopes, disappointments and reactions to those disappointments in a variety of scientific programs. The second goal is to investigate the ideological and socio-economic backgrounds of the proponents of radical life extension, in order to determine how ideology and social conditions motivated the life-extensionists and how this affected the science they pursued. Their specific ideological premises (attitudes toward religion and progress, pessimism or optimism regarding human perfectibility, ethical imperatives, adjustments to prevalent state ideologies) as well as their socioeconomic conditions (the ability to conduct and disseminate research in a specific social or economic milieu4) are examined in an attempt to find out what conditions have encouraged or discouraged life-extensionist thought. The precise definition of “life-extensionism” or “the life-extensionist movement” is difficult to articulate. The term “life-extensionism” is relatively recent (its precise origins are uncertain).5 But of course the terms “life extension” (or “prolongation of life” in early texts), “longevity” or “rejuvenation” are very old.6 The prolongation of life and rejuvenation were pursued by alchemy7 and gerocomia8 in the Middle Ages, and by experimental gerontology9 and anti-aging medicine10 in our time. Obviously they are not the same. In the second half of the 20th century, the advocates of life extension were alternatively called prolongevitists,11 life-extensionists, immortalists12 or transhumanists,13 and did not seem to have an agreed title before that. How then can “life-extensionism” or the “life-extensionist movement” be defined in a way which is not “Whig-historical” – imposing contemporary terms on earlier phenomena? The current study proposes to use the term “life-extensionist” generally to designate “proponents of life extension” and then to seek various and often conflicting ways in which this common and definitive aspiration was expressed in particular historical contexts. Well into the late 1930s there appeared to be no common organizational affiliation of the seekers of life extension whatsoever. In that early period, a wide variety of thinkers joined the quest: materialists and idealists, scientists and men of letters, socialists and conservatives. The research was multi-focal and multi-lingual. The proponents of life extension constituted a congeries rather than a synthetic entity. And even now, the advocates of life extension are very loosely and disparately affiliated, if they are affiliated at all. Still, I would suggest that they constituted a movement, that is to say an intellectual movement defined by a common aspiration. The model is that of other intellectual movements, such as the “Romantic Movement,” the “Enlightenment Movement,” or the “Feminist movement,” having no clear organizational affiliations, but expressing similar aims. As in the latter cases, the writings of the proponents of the life-extensionist intellectual movement show an intricate dialogue and inter-textual influence, cross-fertilization and mutual encouragement. Moreover, the authors expressed an almost universal yearning for a broader cooperation and massive public support. No such broad cooperation and support seem to have occurred until the late 1930s in any of the countries under consideration, yet the striving for their establishment constituted a common ground which may have eventually led to the actual institutional cooperation. The very notion of a “pursuit of life extension” also requires qualifications. It might be safe to assume that few people in the world would oppose healthy life extension per se (though some authors have expressed such opposing statements). The universal drive of medicine to prolong human life for some periods of time is also generally implied. How then can “life-extensionism” be distinguished as an intellectual movement apart from the aspirations of the whole of medicine or the whole of humanity? The difference may just consist in the extent of hopes, the openness with which such hopes were expressed, and the amount of effort directed toward their fulfillment. When the hopes are high and openly expressed, and the effort toward their implementation is great, the protagonist may be described as a “life-extensionist.” In this sense, aspirations for life extension for very limited periods of time, as for example in terminal cases, would not be subsumed under the heading of “life-extensionism” (though these are highly compatible with life-extensionist goals, representing, so to say, a “first step”). As a rule of thumb, when the earnestly expressed aspirations amount to 100-120 years, the life-span attained by humanity’s longest-lived,14 the person who expresses them might be characterized as a “moderate life-extensionist” or simply a “life-extensionist.” Beyond that period, the aspirant may be termed a “radical life-extensionist.” And those who envision virtually no potential limit to the human life-span may be categorized as “immortalists.” Yet, even without mentioning any specific time periods, life-extensionists can be identified by such expressions as “defeating/reversing aging,” “fighting/overcoming death” or even by a prevalent emphasis on the “prolongation of life” or “longevity” generally. These emphases are prominent in the writings of life-extensionists, but almost conspicuously absent in those who might not be categorized as such. The desire to prolong human life may be generally implied in medicine, but it is not always expressed. And certainly, speaking of “radical life extension” is often considered bad taste among physicians and biomedical researchers.15 Furthermore, biology textbooks often do not include aging and dying, not to mention longevity, among the processes of life.16 For the life-extensionists, these topics are central. Indeed, the emphasis on the treatment of particular diseases may distinguish general medical practice from life-extensionism. The cure of a disease might be more readily and immediately perceived, while the ascertainment of human life extension may be a more lengthy and confounded process. Moreover, the possibility of “radical life extension” is not yet subject to empirical confirmation. These might be some of the reasons why “life extension” and even “longevity” are not often mentioned in biological or medical discourse. Yet, it would be a great mistake to think that life-extensionism is somehow watertight and separated from general biology or medicine and that it can be defined by some particular and exclusive “method.” Life-extensionism is not a method – it is an aspiration and a motivation. Or more precisely, it is a reason to develop and apply a method, primarily for the purpose of life extension, which however may also involve treatment of particular diseases. Hence, life-extensionists can be distinguished by their goals, rather than by their methods. Proponents of the very same methods can be perceived as life-extensionists or not, based on the expressed motivations. Moreover, most authors under consideration were not exclusively involved in life extension research, but also in other fields of biomedicine, often achieving high prominence in these fields. The research of aging, or “gerontology,” was a primary field of study, but in no way the only one. Prominent and often world famous scholars and scientists from different fields who sympathized with the life-extensionist goals are the focus of the current study.19 The interest of these authors in radical life extension has received little attention in biomedical history. The current work addresses these omissions. The scientific contributions of the protagonists were extensive, as was their public appeal, and their life-extensionist views and motivations need to be considered to create a more rich and balanced biomedical history. Insofar as the authors extrapolated on and created contemporary biological and medical advances, the history of life-extensionism represents an integral, though until now under-appreciated, part of the general history of biology and medicine. When referring to the general difficulty of defining “holism” in twentieth-century medicine, the American medical historian Charles Ernest Rosenberg pointed out that “twentieth-century medical holism has to be understood primarily in terms of what it was not.”20 In a similar fashion, life-extensionism might be understood by “what it was not.” That is to say, life-extensionist programs may be better appreciated by analyzing the reactions and criticisms raised against them and by their counter-reactions. I would like to suggest three general types of reactions to life-extensionist programs. The first (and very common) type is simply ignoring the topic of life extension, the kind of reaction which omits aging and longevity from processes of biological development. (Such a reaction might be due to the simple reluctance to think about dying or about struggle with the apparently inevitable end.) In this sense, life-extensionism stands out simply by emphasizing the topics which other authors do not. The second type is the principal opposition to the task of life extension, seeing life extension far beyond the present life expectancy as ethically undesirable and theoretically impossible. The American historian Gerald Joseph Gruman, the author of the best available history of early life-extensionism (or “prolongevitism” to use the term coined by Gruman) – A History of Ideas about the Prolongation of Life. The Evolution of Prolongevity Hypotheses to 1800 (1966)21 – termed such principal opposition “apologism,” an attitude rationalizing and even apologizing for our mortality. Earlier, the British philosopher Herbert Spencer defined the opposition as the “pessimistic” as contrasted to the “optimistic view” of increased longevity (1879). “Legislation conducive to increased longevity,” Spencer wrote, “would, on the pessimistic view, remain blameable; while it would be praiseworthy on the optimistic view.”22 Several principal ethical and political objections are commonly raised, such as “overpopulation,” “boredom,” “injustice” and a few others. Such objections were reviewed and countered by the bioethicists Robert Veatch, John Harris and others.23 The historical tradition of these ethical objections questioning the very desirability of life extension is considered in greater detail in this book, in Chapter 4, in the section “British Allies – Literary and philosophical life-extensionism: The optimistic vs. the pessimistic view. The reductionist vs. the holistic approach” and mentioned passim throughout the text. Another branch of the principal opposition asserts the theoretical impossibility of radical life-extension. The most common argument has been that there is a “limit” to the human life-span which cannot be overcome. The various perceptions of this limit are focused on and referenced in Chapter 4, in the sections “Theories of Aging” and “Rectifying ‘Discord’ and conserving ‘Vital Capital’” and passim throughout. Yet, it should be noted from the outset, that even when proposing a “limit” to the life-span, it was often realized by the proponents that this “limit” is quite flexible and theoretically not very limiting. As stated by the Nobel Prize winning physicist Richard Phillips Feynman, “there is nothing in biology yet found that indicates the inevitability of death.”24 Yet, practical limits, the constraints in our ability to greatly increase the human life-span with the current technological means, have been realized even by the most ardent life-extensionists. Their only distinctive feature appears to be the desire and the striving to overcome those limits. The third type of reaction was the specific response (critical or accepting) to particular theories or methods proposed for life extension, or to particular research programs and therapeutic modalities directed toward this purpose. The discussions of this type occupy the bulk of the present history. It appears that the main responders to the specific life extension programs were life-extensionists themselves (for whom this was indeed a major topic of concern). Their responses to particular programs were often severely critical and fiercely controversial. Among the enthusiasts of life extension, the disagreements have been wide. A battle has been waged throughout the century between “reductionist” and “holistic” approaches, with alternate success. “Spiritualists” scorned what they perceived as the ineptitude of modern medicine and science; while “materialists” despised what they saw as unscientific quackery. Even within the “materialistic” branch, there has been much controversy: The more academic life-extensionists argued between themselves on theories, “limits” and funds, and all together attacked unproved remedies which were in turn defended by their providers. Yet, despite all these controversies, life-extensionism may still be seen as a significant intellectual movement, defined by the common goal. Beside the shared goals, other common denominators of life-extensionism are sought in this study, such as a pursuit of constancy, stability and adaptation. In summary, the three aims of this survey are, first, to fill an important lacuna in biomedical history by looking at the understudied history of life-extensionist research and its diverse methodologies; second, to examine the motivating factors for life-extensionist research by looking at the people behind the work, their biographies, psychologies, philosophies, and social and political contexts; and the third, overarching aim is to collect a broad register of life-extensionist authors, and, based on that register, to find common and definitive characteristics of the life-extensionist intellectual movement and its role in science and society. With specific reference to the scientific projects initiated by life-extensionists (the first aim), the current study examines an interrelation between holistic/hygienic approaches and reductionist/therapeutic approaches. The primary focus of the current research is on the formative first half of the twentieth century, with an extension to a later period. I argue that the failure of reductionist “endocrine rejuvenation” attempts, that began at fin-de-siècle and culminated in the 1920s, impacted profoundly on the development of longevity research. The reactions to the failures of earlier reductionist rejuvenation were characteristic. A large number of researchers made a transition to a more holistic approach (such a reaction was particularly pronounced among life-extensionists in France and Germany of the 1930s-1940s). Others conceived of the failures as building blocks and signposts for a continued pursuit on the same path, viewing the human body as a machine in need of repair, and searching for new reductionist methods for its prolonged maintenance by surgery or pharmacological supplements (this type of reaction was prominent among many life-extensionist researchers in the US and the USSR of the 1930s-1940s). Thus, the disillusionment with reductionist endocrine rejuvenation exemplifies varied responses to a scientific failure and modifying research approaches in response to that failure. The conflict between reductionist and holistic approaches is shown to continue throughout the 20th century. Though, it should be noted that several researchers succeeded in combining reductionist and holistic methods. Moreover, several lines of biomedical research are shown to owe their beginnings and changing forms to particular life-extensionist enterprises. With reference to the ideological and social determinants (the second aim), I argue that the hopes for life extension have been coupled to a wide variety of nationalities and ideologies. Insofar as the conditions at home had the most effect, the data are organized according to national contexts. The following contexts are considered: France (Chapter One), Germany, Austria, Romania and Switzerland (Chapter Two), Russia (Chapter Three), the US and UK (Chapter Four). (Unless otherwise specified, all the excerpts are in my translation.) No ideological system or nation seems to have had a monopoly, however strongly it asserted that it constituted the rock-solid foundation for the pursuit of longevity. It may even be that, rather than providing such a foundation, political ideologies enlisted the hope for life extension to increase their appeal. It therefore appears that radical life extension is a cross-cultural value, with a common humanistic appeal above and beyond any particular ideology. Nevertheless, life-extensionism was a strongly ideologically and socially constructed enterprise: In different national contexts, different, and often conflicting, ideological schemes – secular humanism or religion, socialism or capitalism, materialism or idealism, elitism or egalitarianism – yielded different justifications for the necessity of life prolongation and longevity research and impacted profoundly on the way such goals were conceived and pursued. This work investigates such ideological, socio-economic and national backgrounds, and exemplifies the integral adjustment of the specific scientific pursuits to prevalent state ideologies. In attempting to establish common defining characteristics of life extensionism (the third aim), I argue that the persistent striving for adjustment indeed constituted such a defining trait. The term “adjustment” is used here as a general heading in its common dictionary sense. Thus, for example, the Merriam-Webster dictionary defines “adjustment” (synonymous with “adaptation”) as achieving “balance” within a given environment. And “balance” (synonymous with “equilibrium”) entails “stability,” “steadiness” and “constancy.”25 All these terms have been key in life-extensionist writings, and they have been often used interchangeably. The emphasis on these notions could be expected. If adaptation is a defining feature of life, and if a harmonious, balanced state of equilibrium entails durability and constancy, it is hardly surprising that the proponents of the extension of life were determined to adapt and maintain equilibrium and stability without limits, for their own bodies, for their research projects, and for the societies in which they lived. Yet the task of defining specific local adaptations and equilibria is daunting, either for the body or the society. This work attempts to examine some of the more general forms of adaptation characteristic of particular national contexts and instantiates these general forms by more nuanced examples of adaptation of particular life-extensionist projects. In relation to the society, I examine the adaptation of life-extensionist programs to what might be termed “dominant” or “hegemonic” socio-ideological orders. Such “dominants” can be most clearly perceived in the 1930s (a major focus of this work): Socialism in Russia, National Socialism in Germany, Capitalism in the US. In France, the “dominant” was more difficult to see, yet the strong rise of political “traditionalism” in the 1930s-early 1940s may be significant. I suggest three common types of adjustment of the life-extensionist thought, which are exemplified in particular contexts. The first is the rhetorical support of the ruling socio-ideological order (if only to ensure the continuation of the research). This is a kind of mimicry, “when in Rome, doing as the Romans.” Sometimes it was difficult to distinguish whether such support was purely opportunistic or honestly believed in. (Often this distinction did not seem to have any implications for the authors’ words or deeds; when a person was compelled to believe in something to survive, he would seem to believe in it with all his heart, if only to avoid cognitive dissonance.) The second form of adjustment was the positing of metaphorical socio-biological parallels between the workings of the body and of the society in which the authors lived. The society provided the frame of reference for scientific metaphor (“as above, so below”) and when the perceptions of the “above” changed, so did those of the “below.” And thirdly, and perhaps most importantly, specific research projects were often favored as compatible with the ruling socio-ideological order. As will be exemplified, under particular national ruling regimes, certain lines of research were simply not allowed to flourish or were discouraged. In all these senses, life-extensionism was “adjusted” to the ruling national orders or to more local orders. Yet, the striving for adaptation, that is, maintaining stability within a particular environment, appears to be universal for the life-extensionists. Moreover, the support of the existing ruling regime, whatever it may be, may derive from the nature of life-extensionism that seeks stability and perpetuation. In this regard, a question may be raised regarding the forms of society that would indeed merit such a perpetuation. In relation to the body, the striving for stabilization and equilibration has been equally persistent. Insofar as the stability and equilibrium of the body have been perceived to be under continuous threat of disruption and destruction, means for preserving the constancy of the body (or the constancy of the “internal environment”) have been relentlessly sought through a variety of methods. And if some particular methods – “holistic” or “reductionist,” “hygienic” or “therapeutic” – failed to maintain this constancy, new methods for stabilization would be sought, either by embracing a scientific or therapeutic paradigm opposed to the one that failed, or by continuing in the earlier paradigm hoping for its gradual perfection. Still, the desire for constancy appears to be universal and only sought by varied and often novel means. Thus, the underlying conservative (or conservationist) proclivity of prominent life-extensionist scientists in many countries, seeking stability and perpetuation, may have been a source for their diverse and often unorthodox scientific and medical developments. Ilia Stambler, “The unexpected outcomes of anti-aging, rejuvenation, and life extension studies: an origin of modern therapies,” Rejuvenation Research, 17(3), 297-305, 2014. Joseph T Freeman, “The History of Geriatrics,” Annals of Medical History, 10, 324-335, 1938; Frederic D. Zeman, “Life’s Later Years: Studies in the Medical History of Old Age,” Journal of Mount Sinai Hospital, 16, 308-322; 17, 53-68, 1950; Sona Rosa Burstein, “Gerontology: a Modern Science with a Long History,” Post Graduate Medical Journal (London), 22, 185-190, 1946; Sona Rosa Burstein, “The foundations of geriatrics,” Geriatrics, 12, 494-499, 1957; Sona Rosa Burstein, “The historical background of Gerontology,” Geriatrics, 189-193, 328-332, 536-540, 1955; Gerald J. Gruman, “An Introduction to Literature on the History of Gerontology,” Bulletin of the History of Medicine, 31, 78-83, 1957; Mirko D. Grmek, On Ageing and Old Age, Basic Problems and Historic Aspects of Gerontology and Geriatrics, Monographiae Biologicae, 5, 2, Den Haag, 1958; Johannes Steudel, “Zur Geschichte der Lehre von den Greisenkrankheiten” (The history of the study of the diseases of old age), Sudhoffs Archiv für Geschichte der Medizin und der Naturwissenschaften, 35, 1-27, 1942; Paul Lüth, Geschichte der geriatrie: Dreitausend Jahre Physiologie, Pathologie und Therapie des alten Menschen (The history of geriatrics, three thousand years of physiology, pathology and therapy of the aged), Enke, Stuttgart, 1965; Pat Thane, “Geriatrics,” pp. 1092-1115, in Companion Encyclopedia of the History of Medicine, Edited by W.F. Bynum and R.S. Porter, Routledge, London and NY, 2001; V.N. Anisimov, M.V. Soloviev, Evoluzia Concepcy v Gerontologii (The Evolution of Concepts in Gerontology), Aesculap, Saint Petersburg, 1999; David Boyd Haycock, Mortal Coil. A Short History of Living Longer, Yale University Press, New Haven and London, 2008; Lucian Boia, Forever Young: A Cultural History of Longevity from Antiquity to the Present, translated from French by Trista Selous, Reaktion Books, London, 2004. The latter two works do consider the aspirations to radical life extension, yet emphasize the time frame and national contexts other than the present work, i.e. give relatively little space to the first half of the 20th century (about 40 pages each); in the modern period they focus on the US/UK, and do not consider many authors and socio-ideological and scientific aspects examined in the current study. 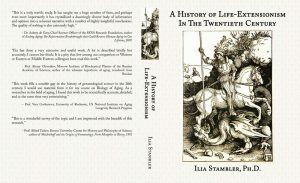 Ilia Stambler, “Longevity and the Christian Tradition,” IEET, January 24, 2017, http://ieet.org/index.php/IEET/more/Stambler20170124. The word “alchemy” apparently took root in Europe in the 12th century. The first alchemical text translated from Arabic into Latin was presumably done by Robert of Chester in 1144 and was entitled Liber de compositione alchimiae (The book of alchemical composition). This was allegedly a translation from Arabic into Latin of an epistle of the Egyptian-Greek-Christian alchemist Marianos to the Arab alchemical adept, the Umayyad prince Khalid ibn Yazid (665-704 CE). The world “al-kimia” is of Arabic origin (originating with Khalid ibn Yazid? ), “al” being the Arabic definite article, and the etymology of “kimia” being very uncertain, with hypotheses ranging from the Greek “Khemeioa” (appearing c. 296 CE in the decree of the Roman Emperor Diocletian banning the “old writings” of Egyptian “makers” (counterfeiters) of gold and silver; “Khemia” (“the land of black earth,” the old name of Egypt); “khymatos” (pouring/infusing in Greek); “khymos (the Greek word for juice), etc. The term “gerocomia” (“gerocomica” or “gerontocomia” from the Greek “care for the aged”) was used since the time of Galen (Aelius/Claudius Galenus, c. 129-217 AD, Galen, 5th Book, De tuenda Sanitate. Gerontocomia (5th book On the Preservation of Health. Gerontocomia), quoted in Sir John Floyer [1649-1734], Medicina gerocomica, or, The Galenic art of preserving old men’s healths, J. Isted, London, 1725, p. 107). Another influential work on gerocomia was Gabriele Zerbi [1445-1505], Gerontocomia, scilicet de senium cura atque victu (1489, “Gerontocomia, or, care and nutrition for old age,” written in Rome upon request of Pope Innocent VIII, 1432-1492). The term “gerontology” (the study of aging) was coined in Elie Metchnikoff, Études sur la Nature Humaine (Etudes on the Nature of Man), Masson, Paris, 1903. The Russian edition used here is I.I. Metchnikoff, Etudy o Prirode Cheloveka (Etudes On the Nature of Man), Izdatelstvo Academii Nauk SSSR (The USSR Academy of Sciences Press), Moscow, 1961 (1915, first published in 1903), Ch. 12 “Obshy Obzor I Vyvody” (General review and conclusions), p. 242. The term “anti-aging” was first widely used in the 1920s-1930s, but mainly in chemical engineering, particularly with regard to the protection of rubber, using “anti-agers,ageresisters, or anti-oxidants” (George Oenslager, Ch. 13. “Chemical and Engineering Advances in the Rubber Industry,” in Sidney D. Kirkpatrick (Ed. ), Twenty-Five Years of Chemical Engineering Progress, American Institute of Chemical Engineers, New York, 1933, p. 181). A Canadian patent “for a process of treating rubber or similar material … in the presence of anti-ageing material” was issued in 1917 (The Canadian Patent Office Record, September 1917, p. 2778). The term was then very seldom used in the field of medicine, as for example in the cursory mention of “anti-aging treatment” in “The Cry for Youthfulness,” The Urologic and Cutaneous Review, vol. 32, 1928, p. 40. The term “anti-aging” seems to have become noticeable in medical discourse only in the late 1940s, with the appearance of such expressions as “anti-aging program” (Charles Ward Crampton, Live Long and Like It, 1948, p. 16); “anti-aging work” (Science Digest, vol. 21, 1947, p. 30), “anti-aging science” (Nation’s Business, vol. 37, 1949, p. 76), “anti-aging factors” (Conference on Problems of Aging, Transactions of the Tenth and Eleventh Conferences, 1948-1949, Josiah Macy Jr. Foundation, NY, 1950, p. 168). As Gardner stated, “In conclusion it would not be an exaggeration to suggest that longevity research work may be the most profitable field of human well-being, as well as from the commercial returns, of all of the present fields of medical investigations” (p. 302). Interestingly enough, T.S. Gardner’s work inspired the philanthropist Paul Glenn to establish in 1965 the “Glenn Foundation,” one of the earliest American sponsors of basic research into the molecular biology of aging and age-related diseases (“The Mysteries of Aging: Paul F. Glenn,” MIT School of Science, http://web.archive.org/web/20130724035802/http://web.mit.edu/science/alumniandfriends/profiles/glenn.html). The term “prolongevity” or “prolongevitism” was coined by the medical historian Gerald Joseph Gruman (1926-2007, University of Massachusetts), in A History of Ideas about the Prolongation of Life. The Evolution of Prolongevity Hypotheses to 1800, Transactions of the American Philosophical Society, Volume 56(9), Philadelphia, 1966, reprinted as Gerald J. Gruman, A History of Ideas About the Prolongation of Life (Classics in Longevity and Aging), Springer Publishing Company, New York, 2003. It seems, the term “Immortalism,” referring to the advocacy of radical life extension, took hold in the late 1960s, after the inauguration of the journal The Immortalist in 1967 by the Immortalist Society, led by the American founder of cryonics Robert Ettinger. The term gained in popularity after the publication of Alan Harrington philosophical-apologetic book, The Immortalist, in 1969. Max More, “Transhumanism: Toward a Futurist Philosophy,” 1990, 1996. Jean-Marie Robine and Michel Allard, “The oldest human,” Science, 279(5358), 1834-1835, 1998. As of 2011, the PubMed database search on “life extension” yielded about 2,000 results, and only about 20 (~1%) contained “life-extension” or “life-span extension” in the title of the article. Apparently, in the vast majority of cases, “life” and “extension” are considered separately. As of 2014, the total number of such articles increased to about 3,400. For example, Max Fogiel (Ed. ), The Biology Problem Solver. A Complete Solution Guide to Any Textbook (Research and Education Association, Piscataway, New Jersey, US, 1990, republished in 2001) contains about 800 problems (“for undergraduate and graduate studies”) relating to all areas of biology and physiology. Yet the single problem even remotely related to aging is that on the menopause. The term “death” is scarcely ever mentioned and is not indexed. And many more such examples can be cited. Natural History of Pliny (translated by John Bostock and H.T. Riley), Henry G. Bohn, London, 1855, vol. 2, Book 7, Ch. 2 “The wonderful forms of different nations,” p. 134, Ch. 49 “The greatest length of life,” p. 200. Herodotus (c. 484-425 BCE) spoke of the extremely long-lived “macrobii” and “Hyperboreans” in Herodotus, The Histories (edited by A.D. Godley, 1920), sections 3.17-25, 4.13.1, reprinted at the Perseus Project, Tufts University, Boston MA, http://www.perseus.tufts.edu/. The extremely long-lived Hyperboreans are also mentioned in the Pythian Odes of Pindar (c. 518 – 438 BC) (Pindar, Odes, “Pythian Ode 10,” edited by Diane Svarlien, 1990, Perseus Project, http://www.perseus.tufts.edu). Hesiod spoke of the Hyperboreans in the “Catalogues of Women” (Hesiod, The Homeric Hymns, and Homerica, by Homer and Hesiod, Project Gutenberg, http://www.gutenberg.org/files/348/348-h/348-h.htm#2H_4_0024). Hufeland’s Art of Prolonging Life, Edited by Erasmus Wilson, Lindsay & Blakiston, Philadelphia, 1867, pp. IX-X, originally Christoph Wilhelm Hufeland, Makrobiotik; oder, Die Kunst das menschliche Leben zu verlängern, first published in Jena in 1796. In the period 1890-1930 – the Russian/French immunologist Elie Metchnikoff, the French physiologist Charles-Édouard Brown-Séquard, the Russian/French surgeon Serge Voronoff, the French philosopher Jean Finot, the Austrian physician Eugen Steinach, the French/American biologist Alexis Carrel, the Russian physician and politician Alexander Bogdanov, the German/American biologist Jacques Loeb, the American biologists Charles Stephens and Raymond Pearl, and the British playwright Bernard Shaw. In the period 1930-1950 – the French biologist and inventor Auguste Lumière, the German physicians Ludwig Roemheld, Gerhard Venzmer and Max Bürger, the Romanian gerontologists Dimu Kotsovsky, Ana Aslan and Constantin Ion Parhon, the Swiss physicians Paul Niehans and Fritz Verzár, the Russian physiologists Alexander Bogomolets and Alexander Nagorny, the American physiologists Edmund Cowdry, Clive McCay and Walter Cannon, and the Russian/British physician Vladimir Korenchevsky. In the period 1950-1980 – the Russian scientists Vasily Kuprevich, Lev Komarov and Nikolay Amosov, and the American scientists Linus Pauling, Robert Ettinger, Denham Harman, Johan Bjorksten and Bernard Strehler. And in 1980-2017 – the British Aubrey de Grey, the Russian Vladimir Skulachev, the Americans Ray Kurzweil and Michael West, and many others. Charles E. Rosenberg, “Holism in twentieth-century medicine,” in Christopher Lawrence, George Weisz (Eds. ), Greater Than the Parts: Holism in Biomedicine, 1920-1950, Oxford University Press, Oxford, 1998, p. 335. Gerald Joseph Gruman, A History of Ideas about the Prolongation of Life. The Evolution of Prolongevity Hypotheses to 1800, Transactions of the American Philosophical Society, Volume 56(9), Philadelphia, 1966, reprinted as Gerald J. Gruman, A History of Ideas About the Prolongation of Life (Classics in Longevity and Aging), New York, 2003. 22. Herbert Spencer, The Data of Ethics, Ch. 3 “Good and Bad Conduct,” § 9, Williams and Norgate, London, 1879, reprinted in the Online Library of Liberty, http://oll.libertyfund.org. John Harris, “Immortal Ethics,” presented at the International Association of Biogerontologists (IABG) 10th Annual Conference “Strategies for Engineered Negligible Senescence,” Queens College, Cambridge, UK, September 17-24, 2003, reprinted in Strategies for Engineered Negligible Senescence: Why Genuine Control of Aging May Be Foreseeable (Aubrey de Grey, Ed. ), Annals of the New York Academy of Sciences, 1019, 527-534, June 2004. Further on the ethics of radical life extension, see: Christine Overall, Aging, Death, and Human Longevity: A Philosophical Inquiry, University of California Press, Berkeley, CA, 2003. The book finds “the usual arguments against seeking immortality” unconvincing (p. 153). See also: Frida Fuchs-Simonstein, Self-evolution: The Ethics of Redesigning Eden, Yozmot, Tel Aviv, 2004. The book argues that “It seems improbable to find ethical objections to increasing life spans, or even immortality, when it means saving someone’s life” (p. 181). Richard P. Feynman,“What Is and What Should be the Role of Scientific Culture in Modern Society,” presented at the Galileo Symposium in Florence, Italy, in 1964, in Richard P. Feynman, The Pleasure of Finding Things Out: The Best Short Works of Richard P. Feynman,Perseus Books, NY, 1999, p. 100. Merriam-Webster Dictionary, in Encyclopedia Britannica, Deluxe Edition CD, London, 2000. Similar definitions of adjustment, adaptation, balance and equilibrium, are given in the Free Online Dictionary, http://www.thefreedictionary.com/.